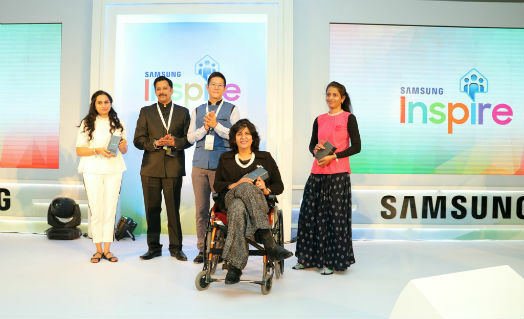 New Delhi: Samsung India has launched Samsung Inspire, a platform to celebrate the inspiring stories of people who have overcome difficulties and stereotypes to pursue their dreams. At the inaugural edition of #SamsungInspire, hundreds of young students from India’s top engineering colleges and B-schools and young Samsung employees from across the country got to meet Ms. Deepa Malik, who overcame many difficulties in her life including a chest down paralysis to win a Silver medal for India at the 2016 Summer Paralympics. Ms Malik, a Padma Shri and Arjuna Award winner and a motor sports and swimming enthusiast, has four Limca World Records to her name. As an activist, she has been instrumental in getting several policies changed in favour of differently-abled people in India. “We do not follow our heart because we worry about what people will think. 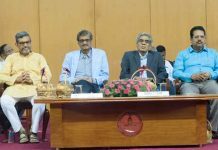 I refuse to be anybody’s stereotype,” Ms Malik told an enthralled audience, narrating her life’s story where she had to break through several stereotypes. Ms. Seema Nagar, a former student of Samsung Technical School in Jaipur and now a trainer at the same school with a government job, also spoke at the event about the determination to achieve her dreams, overcoming social and gender stereotypes to become a trained technician making her parents and family proud. Seema, whose remarkable life story inspired Samsung to make a film on it, hails from a small village near Jaipur and aspires to become a civil service officer, following the recognition of her success. Two Samsung employees also spoke about challenges in their lives and how they overcame them. Samsung Inspire aims to engage with bright young talent in the country, inside and outside Samsung, showcase to them the true values of the organization—People, Excellence, Change, Integrity and Co-Prosperity—and inspire them to overcome their obstacles and grow despite any challenges, while aiming to make a contribution to the society and transform lives. “At Samsung we inspire the world through transformational technologies. This is possible because we imbibe the values of people, excellence, change, integrity and co-prosperity, which inspire and guide each and every employee of Samsung. We sincerely hope that inspirational stories such as that of Deepa and Seema will motivate the world and individuals to overcome challenges and achieve their dreams,” said Mr. BK Lee, Director, Human Resources, Samsung Southwest Asia.